The SPEC MIX® PA4000 Power Auger Delivery System is engineered for dispensing all SPEC MIX dry, preblended products. This material delivery system is built to tackle interior and exterior masonry projects of all sizes. Contractor crews of any size will maximize their efficiency, productivity and safety with the PA4000 system by increasing the mobility and versatility of the material mixing station. This low-profile compact unit holds up to 5 bulk bags each weighing 3,000 lbs. (1,360.8 kg.). Loading the bulk bags with equipment as small as a heavy duty skid steer or small single-stage forklift is safely and easily done from near ground level. With a footprint measuring 7’ 3’’ x 6’ 3’’ and weighing only 2,000 lbs. (907 kg.) empty, the PA4000 is ideal for projects using masonry mortar, grout, stucco, shotcrete and any other preblended cementitious product from SPEC MIX, especially interior and exterior jobs with low height and weight restrictions. 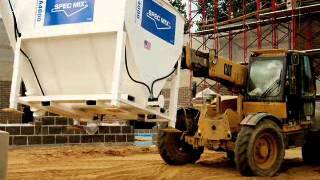 The SPEC MIX PA4000 Power Auger Delivery System is designed to increase a contractor’s efficiency by providing a mobile system that dispenses material close to the craftsmen. This power auger unit can feed a batch mixer or mixer-pump at a rate of 9 cubic feet of dry material in just 2 minutes, regardless of the product specified. The PA4000 eliminates the lifting and shoveling required for traditional mixing methods, and it even eliminates the extra labor required for handling premixed 80 pound bagged products. There are no more sand piles and pallets of bagged materials limiting your mobility and efficiency.